Having just done an Ironman triathlon a month ago, it's hard to look ahead and think that I have just begun my triathlon season. While it may seem anticlimactic, Ironman Los Cabos was a season opener, not an ender. And my triathlon season for 2014 has finally taken shape. After a couple weeks of recovery in April to recuperate from Los Cabos, and reflect on everything that race was (I am working on a post detailing the lessons learned from training for and competing in an Ironman), I began training again, this time acutely aware that I would be slower to start with. But it was nice to actually get back to a lower level of volume before picking it back up to full strength. Now, as we enter May, I am back at full volume for the lead up to Ironman Boulder in August. So here's how the rest of the season looks for me. I hope that this year I see some improvements, maybe some top 10 finishes or even podiums. But most of all I hope to continue to experience the joy I have had over the past year doing this thing that I love to do. I have found that not only do I love triathlon, but my family loves experiencing it with me. And that means a lot more to me than a medal or top finish. This will be a really quick sprint race just to keep my body fresh for racing, and the goal will be to see how fast I can go. With all of this "slow" training, I don't know how fast I can actually run a 5K at this point. I plan to swim as fast as I can for the 1/4 mile swim, bike fast but conservatively (it is a flat and fast course, so no technical issues to contend with), and then run as hard as I can for 3 miles. I am hoping to run a 6:30-6:45 mile avg over the 5K. One thing that makes this race special is that my wife will be joining me for her first triathlon. It will be great to see her experience this for the first time and see if she catches the bug. Yes, Boise. The one in Idaho. And yes they do have water to swim in there. Very cold water. Like melted glacier cold. So why Boise? Good question. I didn't even really know why either until I decided to register for it. First off (and really least importantly, but while we're listing off the pros, what the heck? ), it's a rare "sleep in" triathlon. It doesn't start until noon. So instead of waking up early and almost immediately immersing ourselves in ice cold water, we get to get up when we want, meander over the lake, and then begin suffering. Personally, I like to have some coffee and a little "me" time before I suffer, but I'm weird like that. More importantly, the race is a good prep for Ironman Boulder in a number of ways (about 3000 ft vs. 5000 ft. of altitude, and there are course similarities). It's also a good time to race a half before Boulder, about 2 months. This race wasn't even on my radar, as I was considering doing the Folsom Long Course triathlon in Sacramento, but I discovered that travel would be about the same in cost, and Boise would be a more spectator friendly venue. It's hard to know what to expect for this race, last year it was very hot, and the year before that it was extremely cold (some reports were that people were cycling in their wetsuits). There is one thing for certain though, the water will be cold (did I mention that already?). Every year, MarkAllenOnline coach Luis Vargas hosts a training camp for triathletes in Boulder to go over the fundamentals of training and racing. This coaching program has been so successful for me, and the coaches are so knowledgeable and helpful, that I know that I can benefit greatly from it. Further, this year was too hard to pass up, since the camp will be in Boulder, previewing much of the Ironman course. I will be able to get a feel for how the altitude affects me, and learn a lot from the expert locals. The fact that Luis has vast experience with Ironman and training in Boulder, it's going to be an exciting experience. What better way to celebrate one year of triathlon racing than to race the event which I chose first? This will be the first time I will be repeating a race, and I am excited to see how I've improved. Through all of the races I've done, this has been one of the more fun ones because of the time of year, the size, and the nice roads. Again, just as sprint, which will keep my racing skills tuned right before I taper for Ironman Boulder. Ironman number two will take place in one of the hub cities for triathlon training. I am going to be a bit out of my element, and immediately with a handicap to many of the racers who call Boulder home. Those "highlanders" have already acclimated to the altitude and have already trained on the roads. But I have a desire to finish, and face a new type of challenge, which includes the additional variables of altitude and heat. I am still working on determining what charity to race for, but I will be fundraising for this race. Details to come. But the season does not end there... Next up will be another San Diego race. "San Diego, again? ", you say. To which I say "of course, I live there!" And this particular race has "Classic" in the name. See? It's right there in the name of the race! In truth, logistically it's easy to get to San Diego, there's lots of races to choose from. This one fit in the schedule quite nicely. The bike route takes us into Military grounds, much like it did in Camp Pendleton. I hope it doesn't end up like the last time I was racing in a military area. Somehow my bike slipped out from under me and I got some really fancy asphalt tattoos. 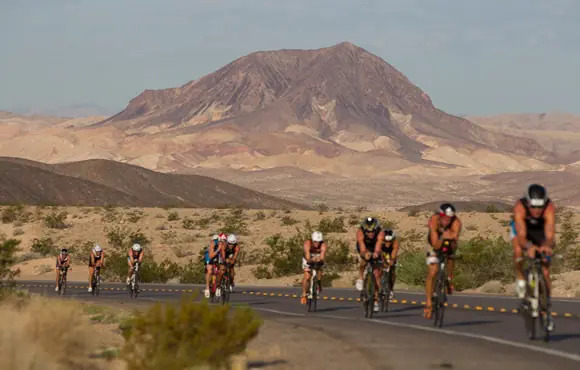 Formerly one of the most challenging full distance triathlons anywhere, with climbing of over 12,000 ft., Ironman has taken over this race, made it a half, and tamed the beast pretty significantly. While not nearly the behemoth of a race it once was, there will still likely be winds and heat to deal with. I really wanted to finish the season off with another half distance race, and the choices were this one or Lifetime Soma in Tempe, Arizona. When I approached my family on their preference between Tempe and Vegas, the choice pretty much made itself. This year will truly be a test for me from the perspective of racing. While last year was more of a buildup to Ironman Los Cabos, this year will be a consistent racing season of multiple types of distances, and I am really testing my abilities to perform to the best of my potential. Ideally I'll hold up and be able to do well in them all, but most importantly I'll enjoy the process, keeping my meditation and spirituality strong. The rest will take care of itself.